The current Fox family in Husthwaite can be traced back about 13 generations to Coxwold. There are records of the Fox family there from the late 16th C and members were listed as masons from John Fox born 1730s whose descendants were all in the building trade as stone masons, bricklayers, master builders to this day. Around 1774 a John Fox was working at Newburgh and also mended St Nicholas' Church tower at Husthwaite. The construction company "E. Fox and son" is a member of the Federation of Master Builders and was established about 80 years ago by Edgar Fox and his son Raymond (father of Tony and grandfather of Matthew and Christopher). John Fox born Coxwold 1738, a mason, married Isabella Black; their son Thomas, also a mason, married Elizabeth Smith in Coxwold; their son William, a stone mason, born in Coxwold, married Ann Richardson and moved to Husthwaite where he and his sons continued with the building trade. Their fourth son Isaac Richardson born in 1850, was a bricklayer, but his main occupation and interest was with music and in Bulmers 1890 directory he is given as a bandmaster. A history of the Brass Bands of the British Isles gives "Easingwold Temperance Band - Active in 1887... played at a grand ball in Husthwaite in 1899. Isaac Fox was a cornet player and conductor and was the band master. 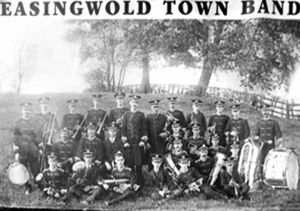 When the band folded, sometime before 1930, he became conductor of the Easingwold Town Band." Isaac was interested in verse and lyrics from an early age. 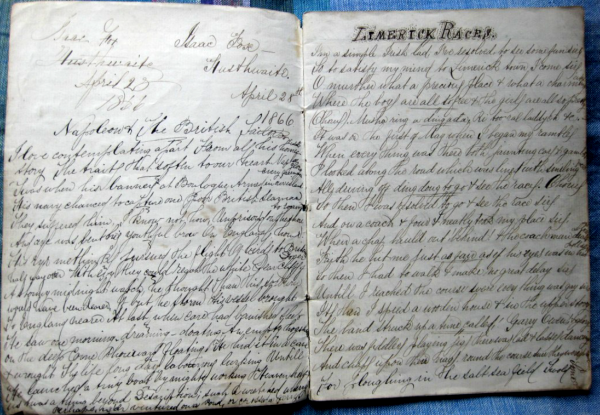 In 1866, aged about 16, he copied many of these into an exercise book in beautiful script, starting with the first verses of "Napoleon and the British Sailor" written by Thomas Campbell, a Scottish poet 1777-1844, published in 1842. This was followed by the Old Time Song Lyric "Limerick Races" - "I'm a simple Irish lad, I've resolved to see some fun. So to satisfy my mind, to Limerick town I came sirs...", then "Paddle Your Own Canoe", and religious lyrics such as "There's a light in the window for thee brother, there's a light in the window for thee. A dear one has moved to the Mansion above..." to writing about Insects from an article from 1819 published in "The Atheneum or Spirit of the English Magazines under Natures Diary for April - Birds" to the first verse of "Beer" by George Arnold (born 1834 New York) "Here, with my beer I sit while golden moments flit! Alas, they pass unheeded by, and as they fly, I, being dry, sit idly sipping here, my beer" - noted as a poetical novelty! On the back page, in typical schoolboy fashion Isaac gives his address as Husthwaite, Easingwold, Yorkshire, England, Europe etc. also the address Middlesbrough, Yorkshire, England, Europe etc (where his future wife, Sophia came from, indicating that in his youth the family already had some connection there). Isaac married Sophia Old, a dressmaker, in 1873, living at Hill Top (later called Clarence House in The Nookin). Their fourth child Albert Edgar born 1887 married Louisa Black from Carlton Husthwaite. In 1939 Edgar is listed as a Master Builder from Clarence House. His son Raymond Richardson Fox born in 1921 continued in the building trade followed by his son Anthony (Tony) who works with his own two sons, Matthew and Christopher. Mr Fox, who was 82 years of age, was a native of Husthwaite and began his career with the Husthwaite Old Brass Band... Apart from his interest in bands, Mr Fox was prominently associated with the Methodist Society at Husthwaite and acted as choirmaster and teacher at the Sunday School for 50 years. On the occasion of his jubilee he was the recipient of a handsome testimonial and present from that body. In all those capacities he gave great pleasure to the residents, and his death is a source of deep regret to all who had the pleasure of his acquaintance." The Easingwold Town Band headed the funeral as it proceeded to the cemetery playing "Lead kindly light" ... and as a passing tribute to an old comrade played "O God our help in ages past" ... chief mourners included family members Mr and Mrs George Fox, Mr and Mrs Edgar Fox, Mr and Mrs J E Smith, Mr S Fox, Mr Ronald Smith, Master Raymond Fox, Master Thomas Fox, Misses Dorothy and Peggy Fox, Mrs Arthur Fox, and a large number of local people."